Plastics were invented in the 1800s but their mass production began in the 1950s and has since taken off around the globe. While it is possible to recycle most types of plastic, it is estimated that only about 25% of plastics are recycled worldwide. A great deal of the plastic ends up in our oceans, seas, and waterways. Research has shown severe impacts on our environment and our economy from this type of pollution. 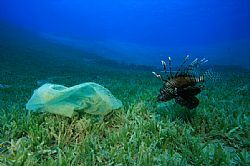 Marine life such as sea turtles, whales, seabirds and other marine life are eating the plastic and dying. Scientists are looking at long term impacts of pollutants consumed by fish and their potential effects on human health. It has become such an environmental concern that a little over a decade ago a science of marine debris began the study of garbage in our waters. A recent study showed the global magnitude of this problem. The Malaspina expedition of 2010 was a nine-month research project to study the effects of global warming on the oceans and the biodiversity of the deep ocean ecosystem. Andres Cozar and his team were to study the small fauna living on the ocean surface. He was reassigned when plastic fragments kept turning up in water samples to assess the level of plastic pollution. Using that data and the data gathered by four other ships he and his team of researchers completed the first ever global map of ocean trash.